Virtual Reality (VR) is the hottest concept and VR games provide players with a fully imersive gaming experience like nothing else! Omescape has teamed up with the best VR game developer to bring you the world's first team based VR escape game! Omescape London brings the best wireless Virtual Reality escape room experience to the UK for the first time. You are the last remaining survivors of humanity. Can you complete your last mission and reverse the apocalypse with HUXLEY? An old legend tells of Huxley, a source of infinite energy hiding in a secret place. Our beloved father has dedicated his entire life to finding it, but unfortunately he mysteriously disappeared. Now it is up to your team to follow the legend and complete his life’s work. Discover in virtual reality the 19th century steampunk world in search of the ultimate energy. The ingenious inventions of the professor will help you with this. Serial killer known as the Silent Man has kidnapped a child and keeps her at an unknown location. He was apprehended but a deadly brain disease has put him into a coma. Now your team of cyber-detectives has to enter Silent Man's mind to discover a key memory, which will disclose the location of the kidnapped child. You have exactly 1 hour to complete your task before the connection is lost! Silent Man's mind is dangerous so you will need to protect yourself by doing swimming, smashing, shooting and flying! Save the child before it's too late! Virtual reality (VR) is the hottest new concept in gaming, bringing an immersive experience like no other. Omescape has teamed up with a leading VR developer to bring you the world’s first team based VR games experience. VR technology and the immersive experience it offers has the ability to convince the human brain that it is somewhere it is not. Using a VR headset and earphones, players are transported into another environment and can use their movements in real time to take action in the new virtual reality setting. People can interact with the game in a real and physical way, making the story and characters more believable. The virtual world is currently being explored by tech companies across the world, with a selection of VR headsets now available to consumers. VR is also being used and introduced into education and training, to help people learn new skills without having to travel or put themselves in potentially dangerous situations. Until recently, VR games had only been available for single players, but as the technology adapts and evolves it is now possible to experience VR as a group. VR technology brings a whole new immersive element to escape room games, making them even more action-packed and fun. 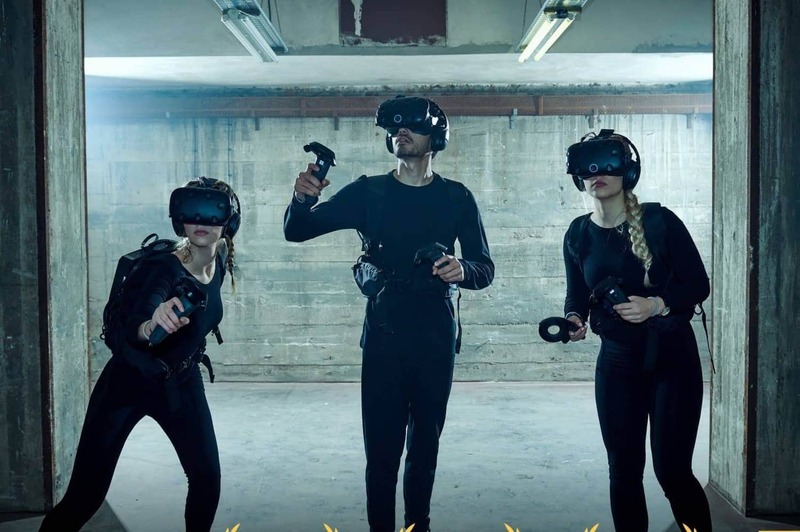 A VR group game has less focus on puzzles and instead encourages all members of the group to take part physically – from shooting and flying to dodging the bad guys! It’s a great team experience if you like to scare yourselves and take part in action-packed fun. Together you’ll take on various virtual challenges as the engaging story unfolds. VR team games are not just for pro-gamers – there’s no VR experience necessary and all of the equipment will be explained to the whole group beforehand. See you there!